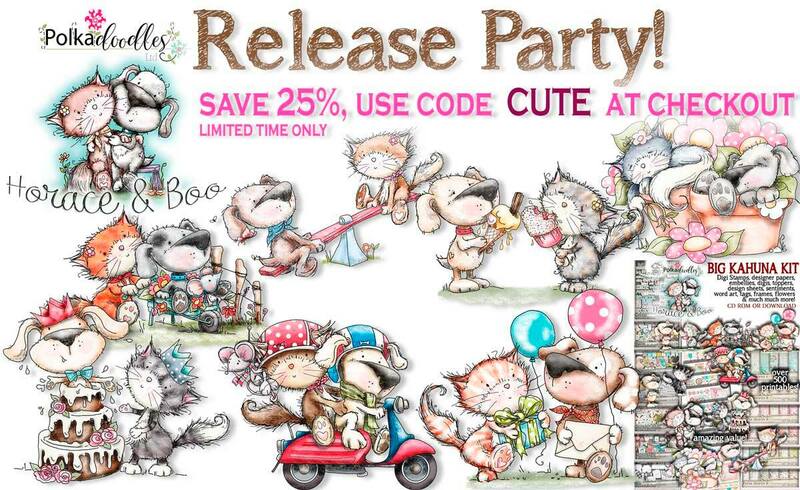 Have you seen our amazing new release ? 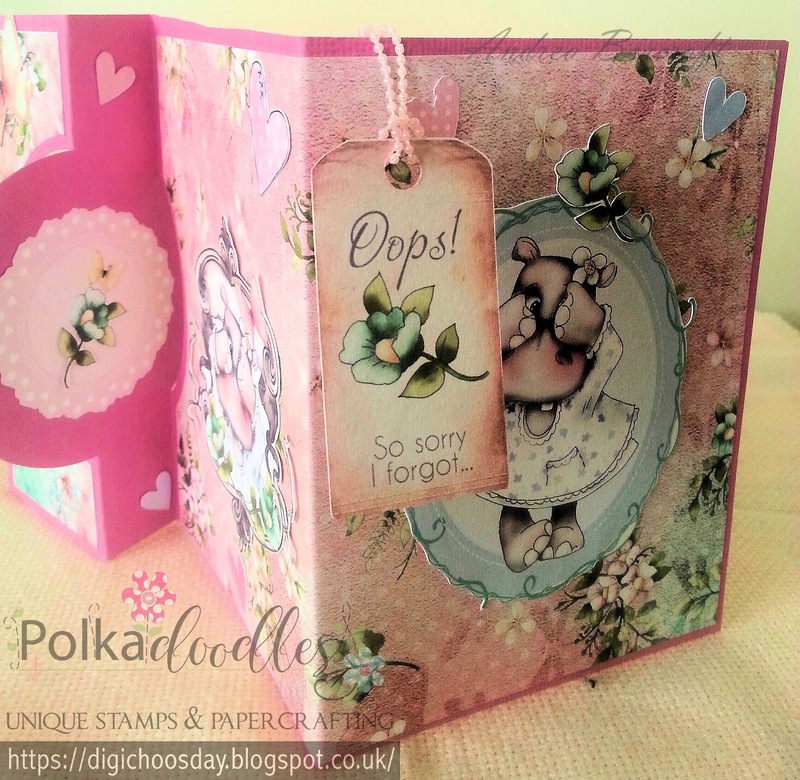 Andrea: - My sweet three fold card with the lovely Helga printable design sheet you can find it here.. 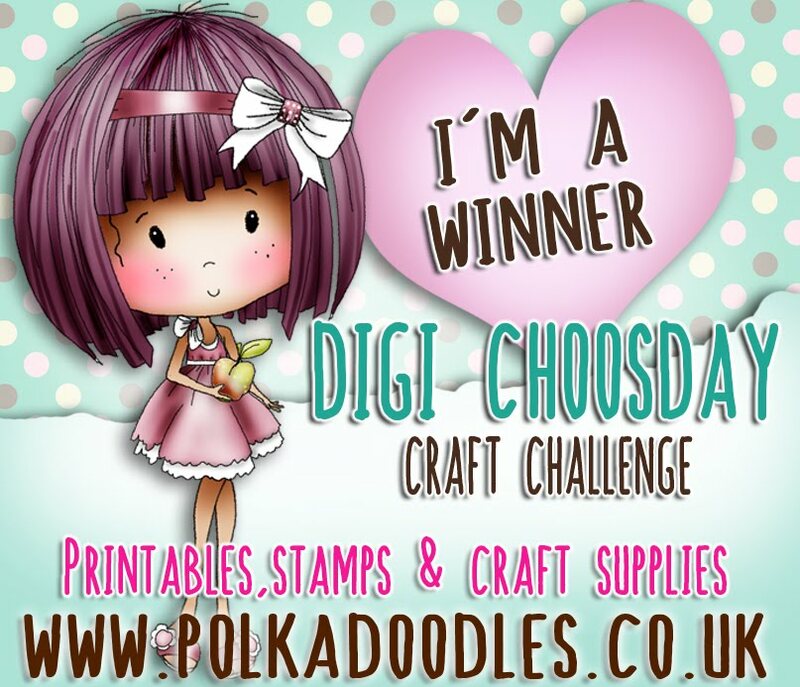 Please email us sales@polkadoodles.co.uk quoting DCW170001 to claim your prize of 3 digi images from the digi store! 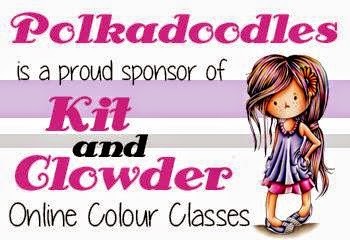 *discount not available on some products, discount will be applied at the checkout so if it does not appear in the basket at checkout it is not applicable to your chosen products. Certain bundles/images only. 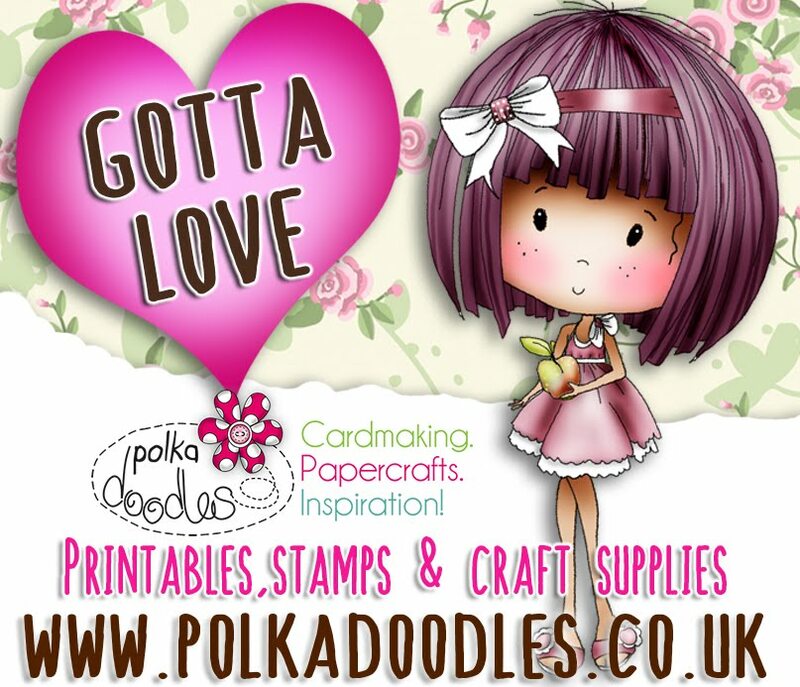 Discounts will not be applied retrospectively if you forget to add the discount to your basket before you check out. 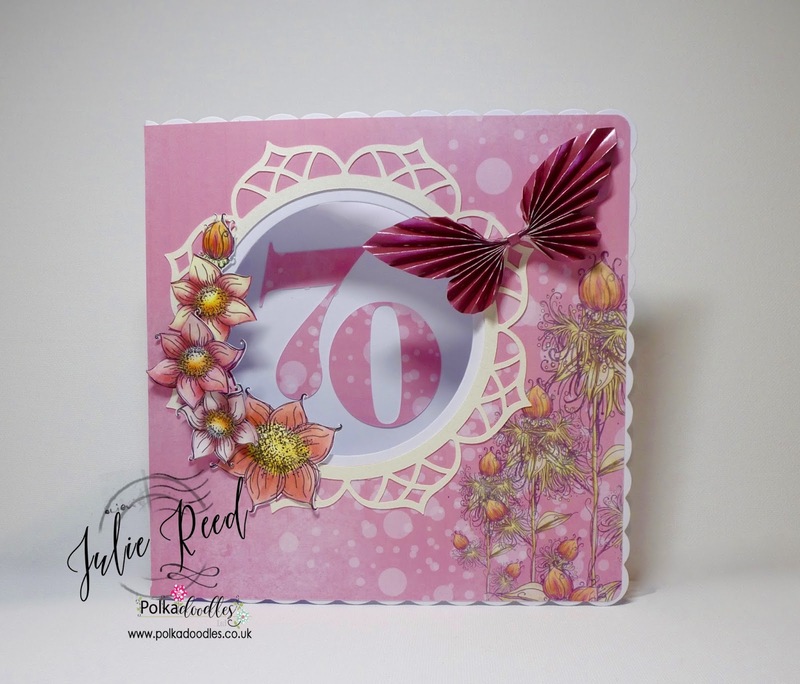 Julie - I have used a digital paper and Pre-coloured flowers from the Summertime Stamp Me CD, to make my round aperture card for my Hubbys Aunts 70th Birthday. 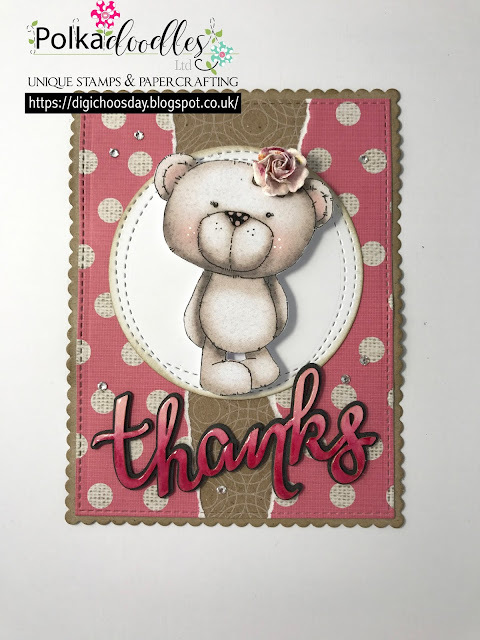 Yvonne - This week I opted for Winnie Fruit Punch Collection and this week I coloured the image 'One For You' which you can find here. 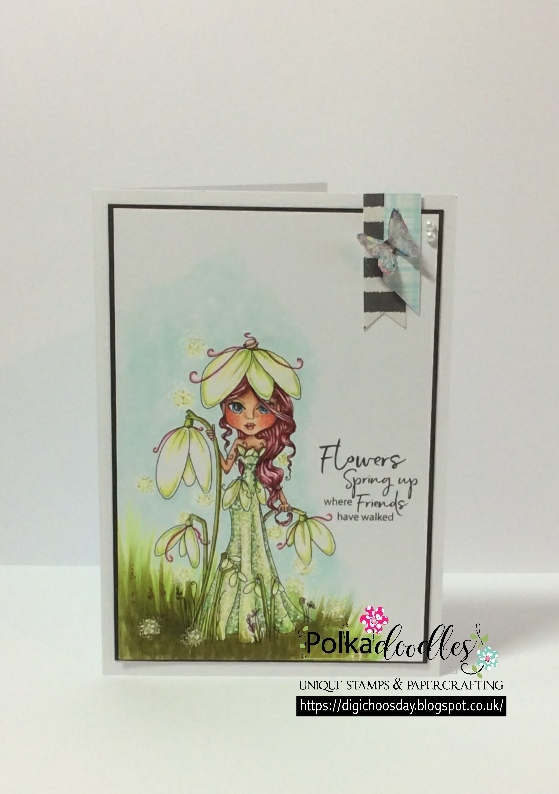 I used papers from the Octavia Frosted Winter Collection which you can see here and also the Winnie in Wonderland Collection which you can see here. 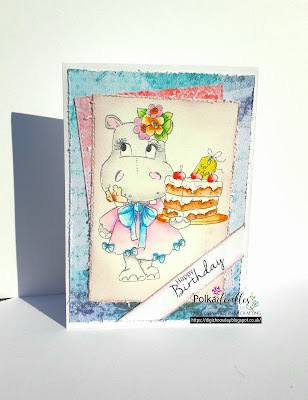 Hester - This week for a special Birthday I have used A Gift - Winnie Fruit Punch I love the collection from Winnie Fruit Punch. 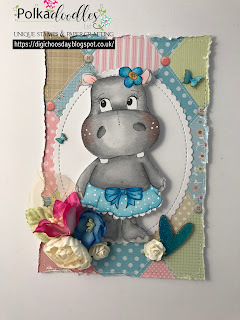 Melissa - For this weeks inspiration I have used the adorable Helga Hippo - Hello. Jane P- This week we are creating birthday cards in celebration of Anjies' Birthday. 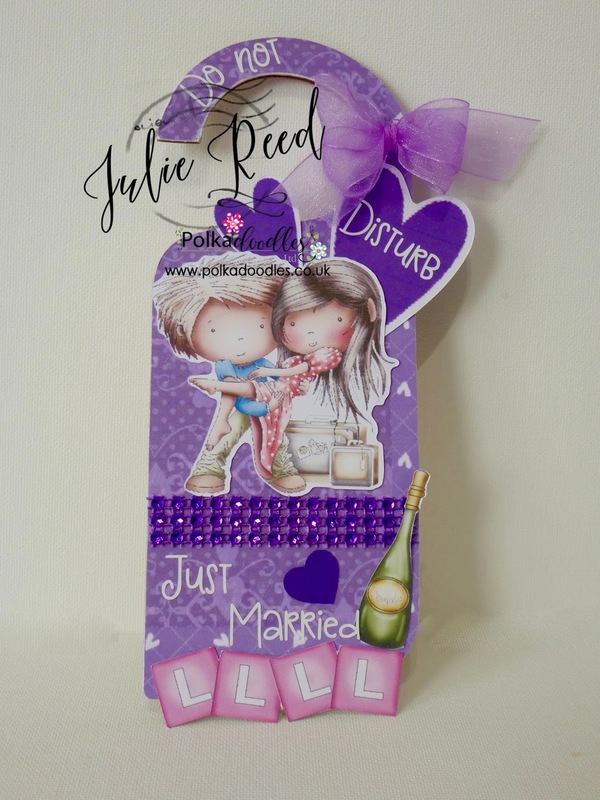 I have used a combination of Many different collections. Details on my blog. 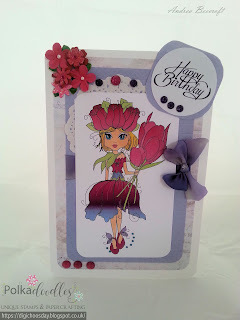 Katrina ~ My birthday card features Winnie from Winnie in Wonderland. The digi and paper can be found in the Winnie in Wonderland Big Kahuna Download. Winnie Wonderland Time will Tell Digi can be found HERE. Happy Birthday to Anjie! 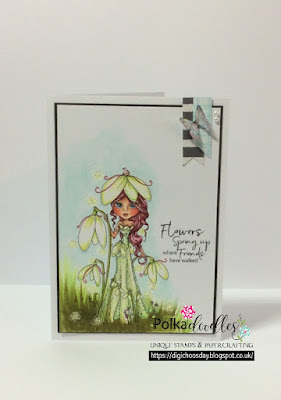 Monica- To celebrate our dearest Anjie´s 50th birthday, I use a butterfly from Winnie Fruit Punch collection to make a shaped card. Papers, flowers, sentiment and, of course, the lovely Winnie, are also included in this collection. Jane S - So what do you make for a special lady with a special birthday who is mad about Alice in Wonderland?? Why a Funny Old Bag dressed as the Mad Hatter of course!! So this is Revolting Kiss decorated with elements from the Winnie in Wonderland Collection. I have also used the Elegant Nest die set. I used Winnie Sugar Sprinkles Springtime and Winnie Sugar Sprinkles Paper Heaven 1 Bundle. Željka-Hello!! 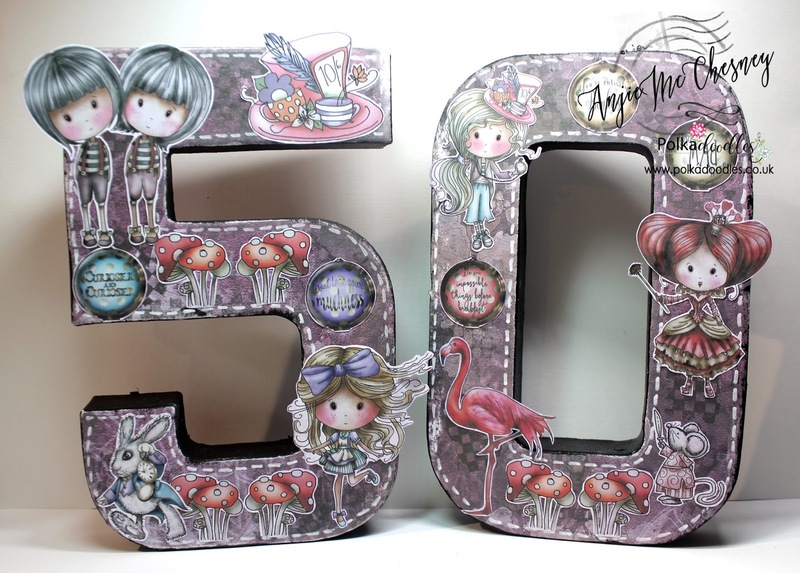 !This week we are celebrating Anjie's birthday.Happy birthday Anjie!!!! 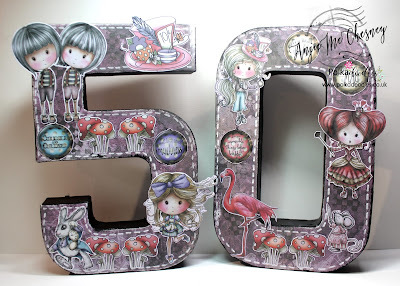 Anjie - Eeek I'm really going to be 50 on Saturday, how exciting. Thank you everyone for your lovely makes, this truly is an amazing team. 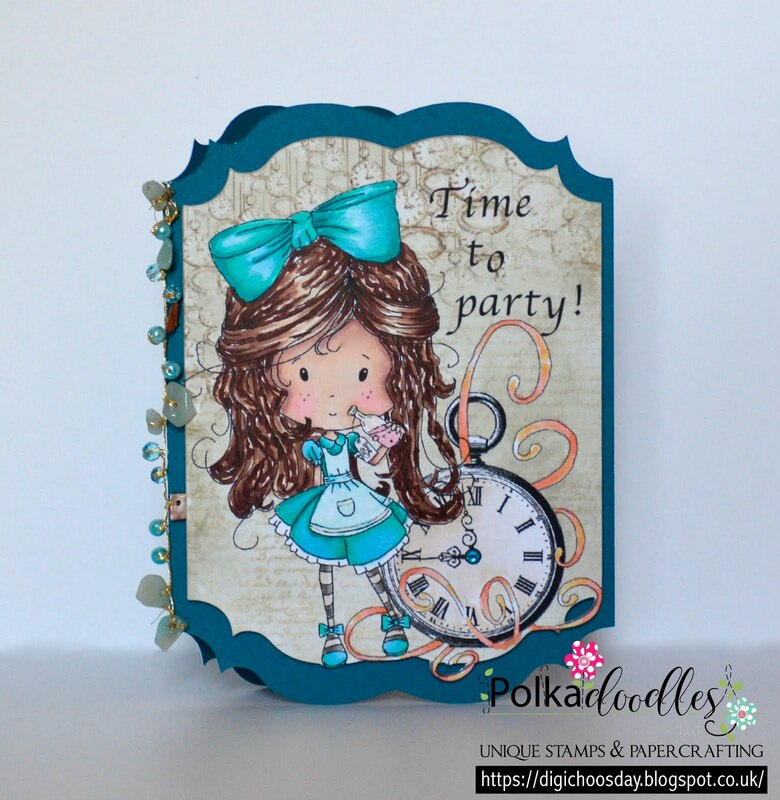 So of course I had to use the fabulous Winnie In Wonderland collection to make something to celebrate this frabjous unbirthday. And here it is. You can see all the details and close up photos on my blog. Dawn - This week for a special Birthday I have used A Gift - Winnie Fruit Punch I love the collection from Winnie Fruit Punch. 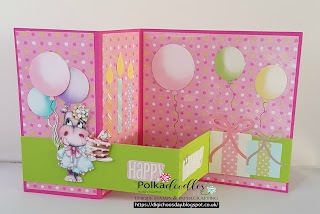 Pauline - I have used three of the beautiful papers from the Winnie Sugar Sprinkles Springtime Download Bundle to create my Special Birthday card. The papers in the Polkadoodles collections are so gorgeous and perfectly co-ordinated, they are just right for using on their own to create cards like this. 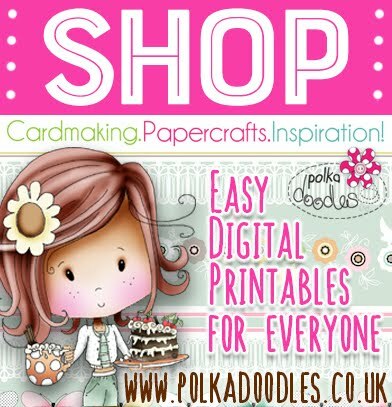 Please email us sales@polkadoodles.co.uk quoting DCW160001 to claim your prize of 3 digi images from the digi store! 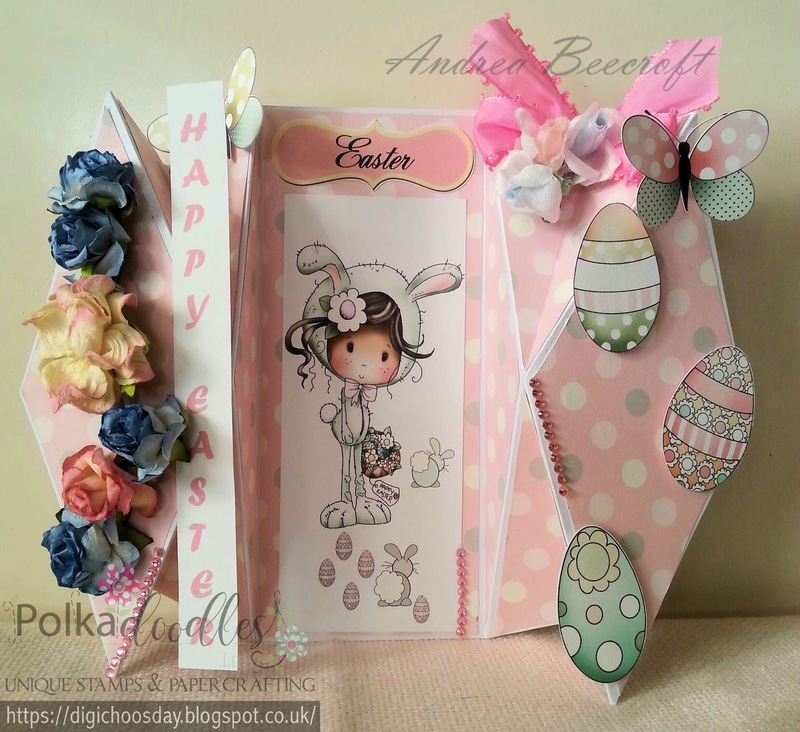 Andrea : Here I have made an Easter Card, it's a diamond shape folded card, where I have used "Winnie Sugar Sprinkles" Easter Design Sheet. I hope you like it. 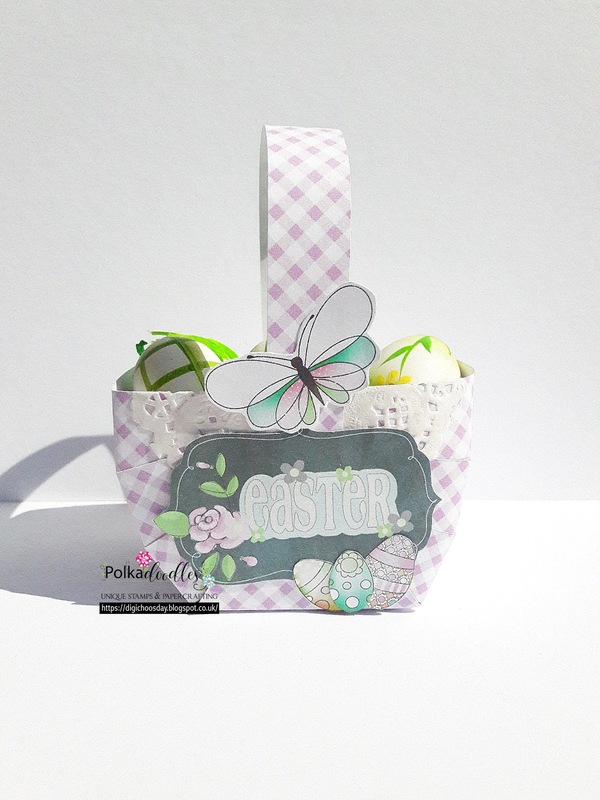 Katrina ~ I thought it might be fun to make a shaker box for some Easter goodies! Helga looks so lovely in what might be her Easter Bonnet; she and the butterflies can be found in the Helga Hippo Design Sheet Duo, Helga Hippo Design Sheets Download Bundle or Helga Hippo - Big Kahuna VIP Download Bundle. The frame is cut from Winston Collection paper. 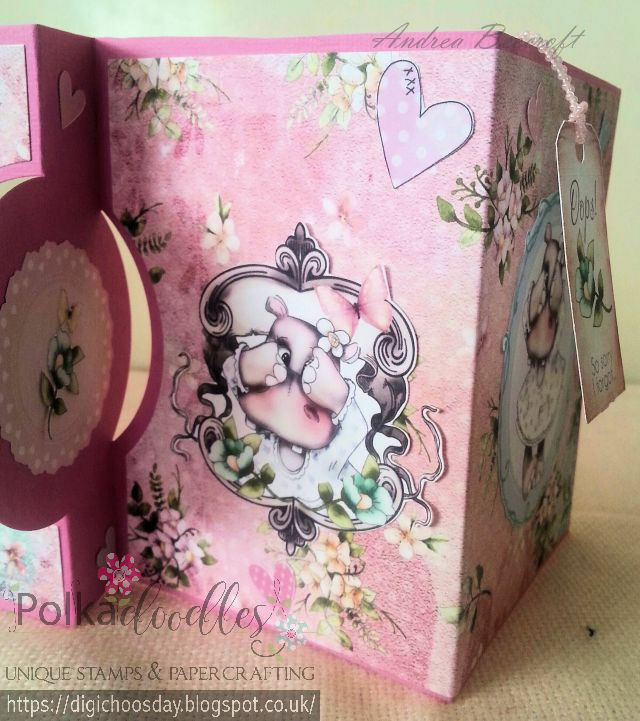 The box itself is cut from the Distressed Wood Printable Papers Download. Have a lovely holiday! Julie - This week I made an Easter Basket with a difference for my son, then coloured up some elements from the Sticks & Bones Collection. 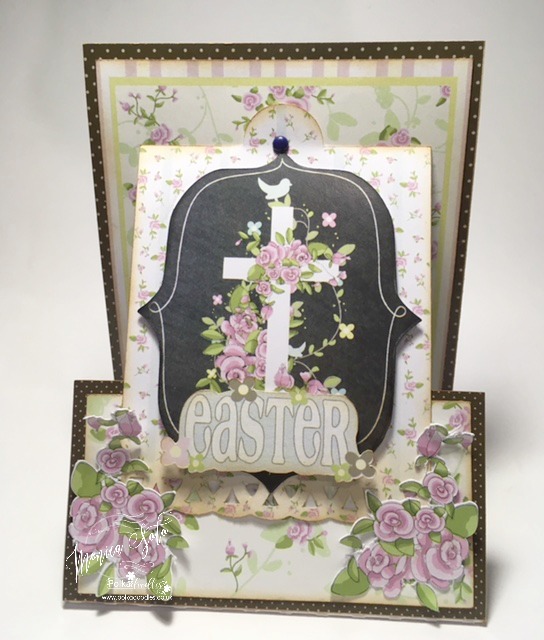 Yvonne - For an Easter theme I had to use the Winnie Sugar Sprinkles Collection, which you can find here. I made a cute little scalloped favour box on my Silhouette Portrait and covered it with a paper from Work & Play 10 - Country Life. 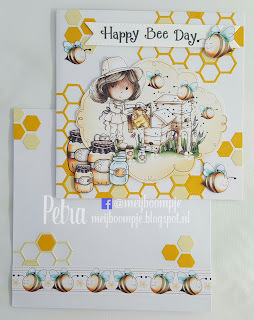 You can see the whole collection here or the paper I used, in this bundle here. 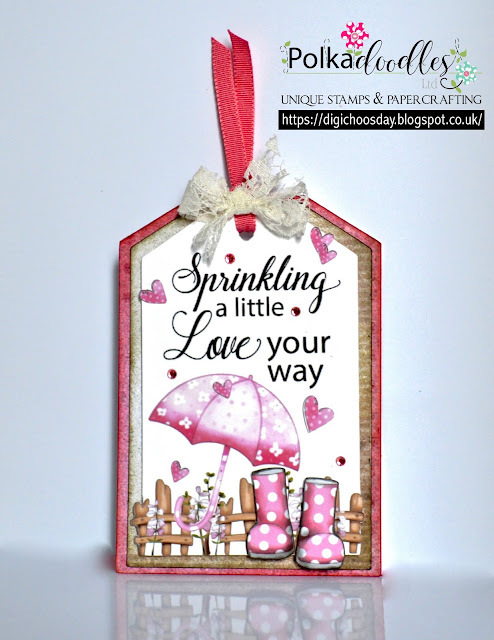 Anjie - I have used design sheet 7 from the Winnie Sugar Sprinkles Springtime collection. 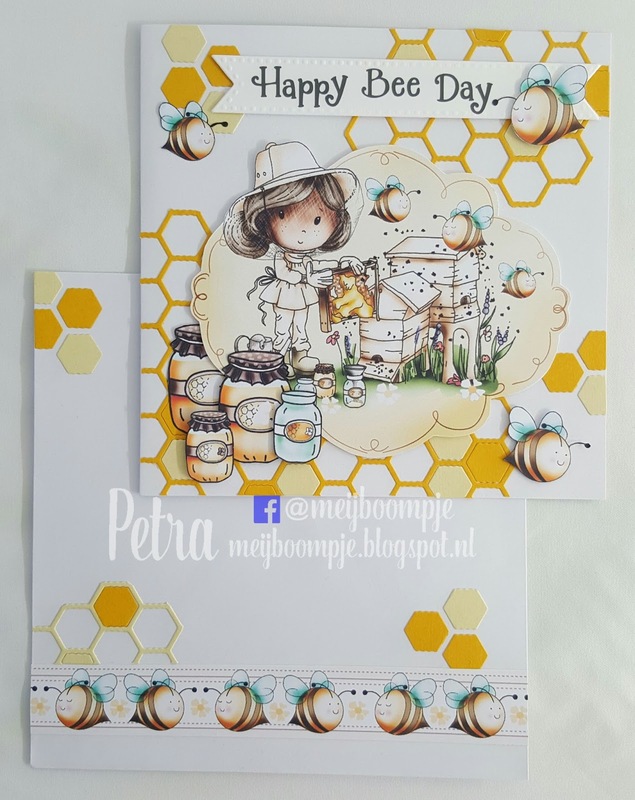 I've inked around the edges of the paper to make it stand out as I haven't matted any card onto the back of it. I also added a squiggly line around the edge with a fine liner pen. I've mounted all the embellies on to 3D foam and there you have it. 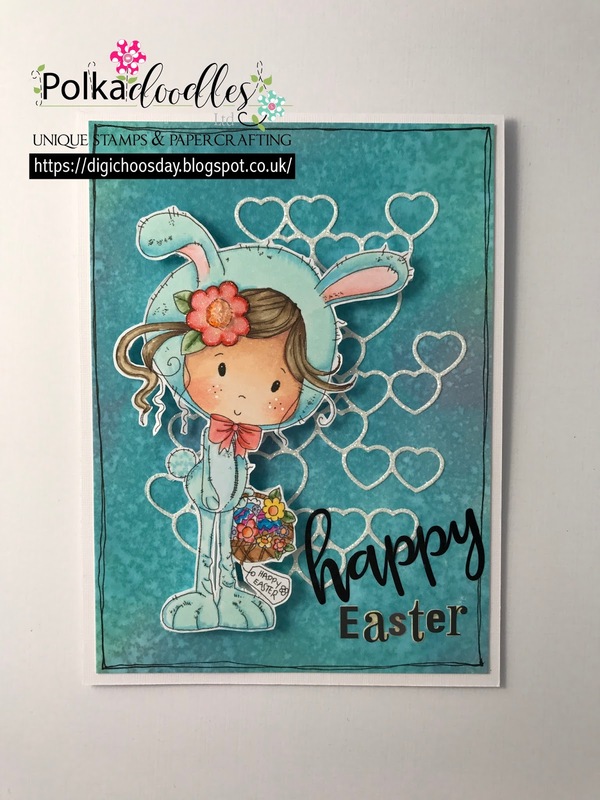 Jane S - I have used the white rabbit from the Winnie in Wonderland Collection and merged him with an Easter egg from Winnie Sugar Sprinkles and coloured them both with pencils. 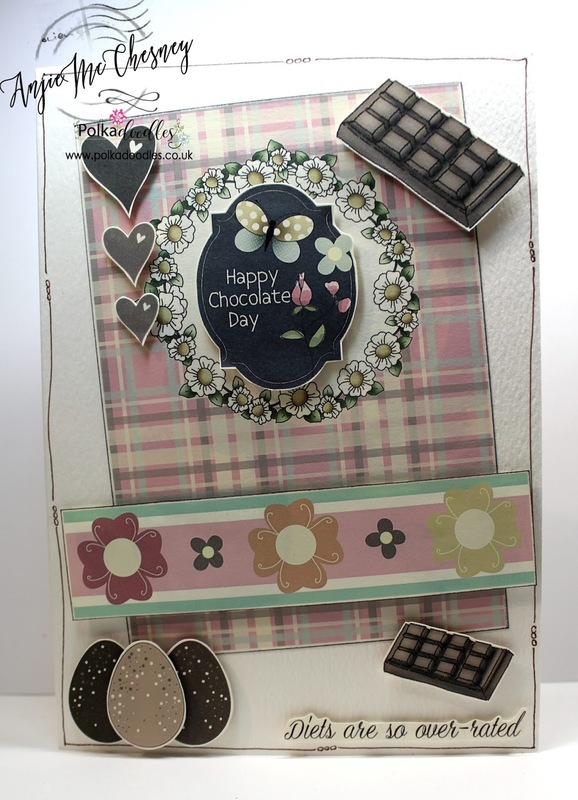 I have also used papers and pre-coloured goodies from this bundle and the Toadstool Border and Cherry Blossom dies to decorate my shadow box. 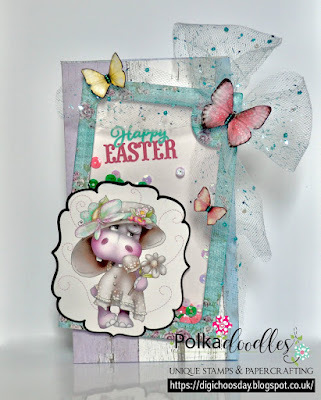 Monica - For this Easter challenge I used papers, embellishments, sentiment and flowers from Winnie Sugar Sprinkles Springtime Collection and I made a card to celebrate my country Easter tradition. 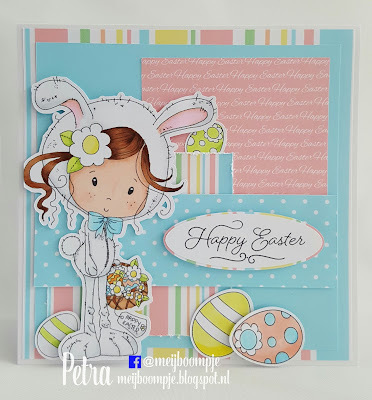 Melissa - For this weeks Easter theme I have used the gorgeous Happy Easter Winnie from the Winnie Sugar Sprinkles Collection. Jane P- What a fun challenge it was this week! Easter is the theme and what better collection to use that the Winnie Sugar Sprinkles Springtime Collection. Dawn - For this weeks Easter theme I have used the gorgeous Happy Easter Winnie from the Winnie Sugar Sprinkles Collection. Julia - Today I am thinking Spring, and have Used a Darling Buds image and Sentiment. 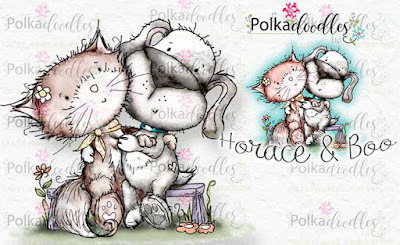 I have coloured this little beauty up with my Copic markers & Spica Pens. Unusually I have gone for a really C&S look. Petra- Not very original, but I also chose for Happy Easter from the Winnie Sugar Sprinkles Springtime Collection. 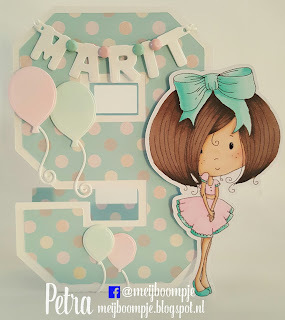 She is just to cute not to use!! 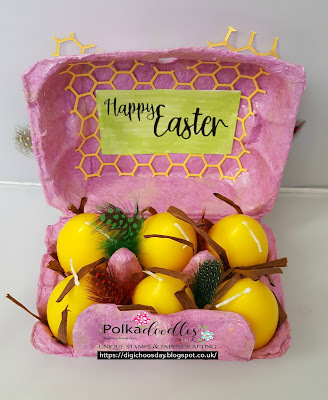 The eggs are from the same collection. 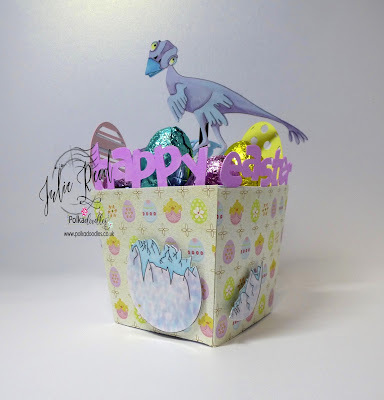 For the papers I used the Free Tatty Twinkle Easter Digital Craft Download (FREE?? Yes FREE!!) The colours are perfect for this easter card. 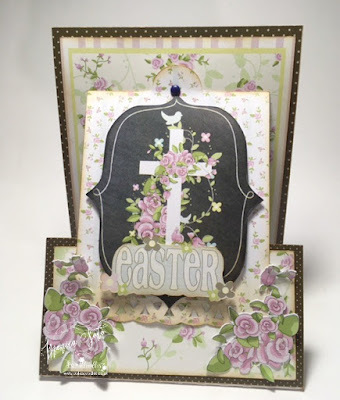 Pauline - I have used a sweet topper from the Winnie Sugar Sprinkles Springtime Download Bundle to create my Easter card. 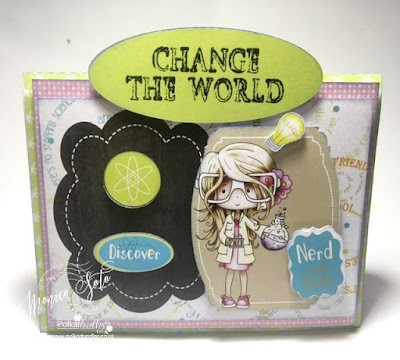 I have used elements from the Toppers, Embellies, Quotes, Papers and Tags/Frames sections. 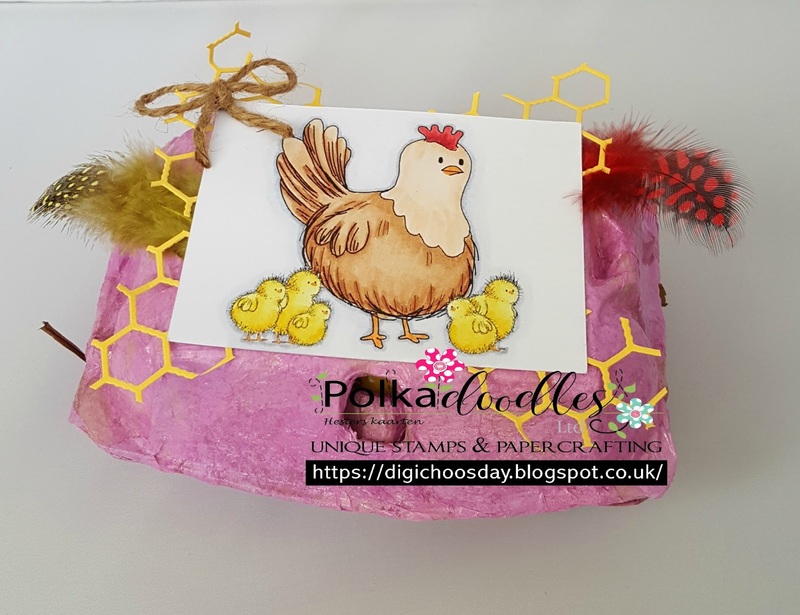 I have fussy cut the main image and layered it up using foam pads, I also fussy cut an additional bunny, butterfly and chick to embellish my card. 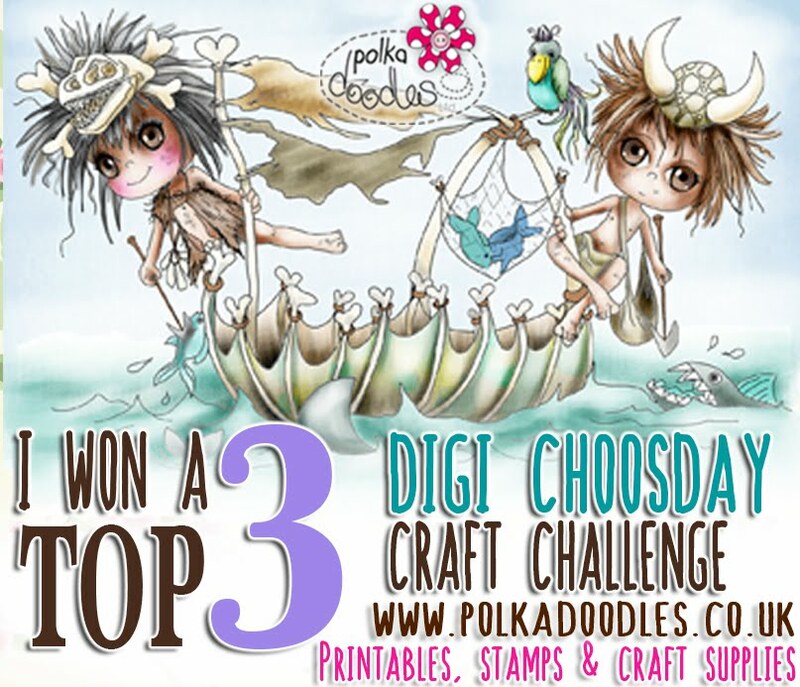 Please email us sales@polkadoodles.co.uk quoting DCW150001 to claim your prize of 3 digi images from the digi store!